Today, I found a pretty interesting deal. I remember a little ways back, and you could find some great BBE pedals at killer prices. Well, today there is another good one. It’s the BBE Free Fuzz pedal. Normally, this lists for $169.00. Musician’s Friend has it for $119.99, but Amazon has it available for $72.95 with FREE shipping! There are only 4 items left, so you’ll need to jump on it if you want one. 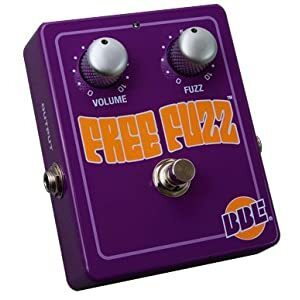 The BBE Free Fuzz effects pedal works for guitar and bass and was patterned after a rare and sought-after silicon transistor fuzz pedal made famous by players like Jimi Hendrix in the late ’60s. The BBE effects pedal provides a wide range of creamy, dynamic fuzz effects with an almost endless amount of sustain for soloing and chunky rhythms. Sweet deal on a Way Huge Green Rhino!